Fifth Harmony performed on NBC’s Today at Rockefeller Plaza in New York City on July 10, 2015. They all wore black and white outfits and looked chic in their respective ensembles. Camila looked super cute as she wore black leather skort paired with a white crop top and black thigh-high boots. 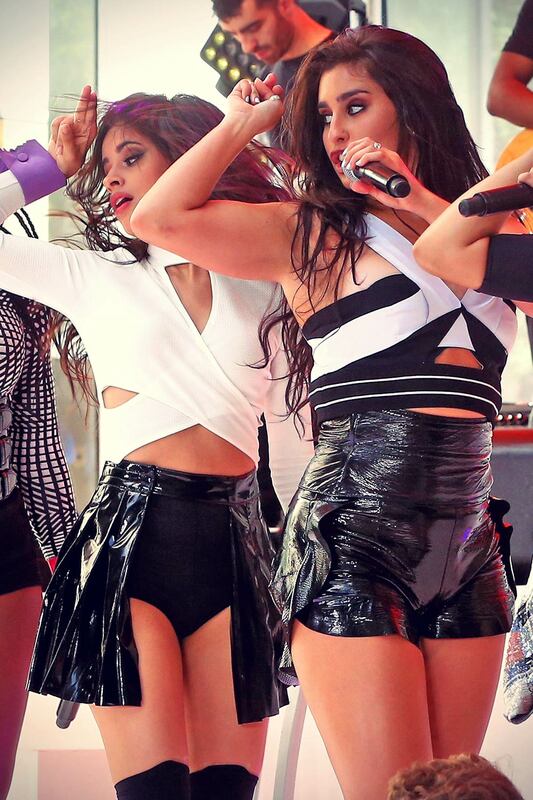 Lauren was wearing black leather hotpants paired with monochrome crop top, flaunting her toned figure. While, Ally was wearing black tiny hotpants with a black and white jacket that she wore over a red bralet. She also tied a checkered shirt around her waist. Meanwhile, Dinah and Normani, both opted to wear black shorts with a monochrome top, flaunting their curvaceous figure. They all looked fabulous in their monochrome outfits, and totally rocked the show. We totally enjoyed it!